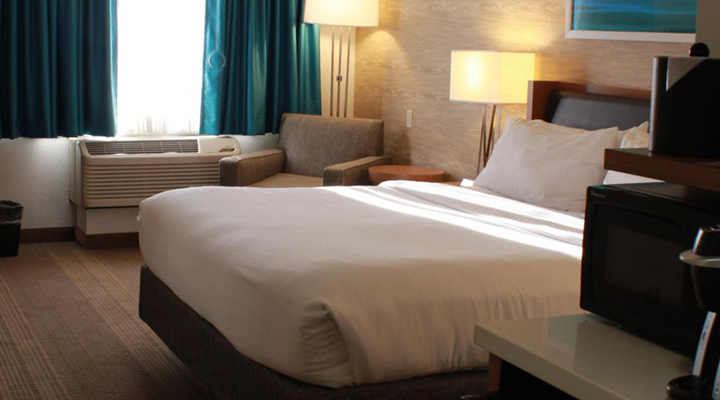 Located one (1) mile from the DISNEYLAND® Resort, this family friendly Holiday Inn is the perfect hotel for your Disney vacation. Take advantage of their BBQ area where you can use their grills, enjoy a meal at their restaurant on property or relax at their large outdoor swimming pool. As an exclusive Get Away Today bonus, you’ll receive free hot breakfast daily for your entire family - up to $35/day exclusive savings (gratuity not included)! Just returned from our amazing stay at the Holiday Inn and thought I would add some important things that we found throughout our stay! First of all Getaway Today was amazing! They answered all our questions by email and sent emails before we left to make sure we received all the park tickets and reservation details via post! We live in the U.K so this was a really nice touch! We arrived in Anaheim at the hotel at about 9 in the evening. Hotel right next to the freeway but you can’t hear any noise from the rooms. We stayed for 9 nights and we had a king size room. Bed was comfortable and the room was a nice size on the 8th floor. We noticed after a few days that if you are on The right side of the hotel you can see the Disneyland fireworks at night from The window so if you want this maybe email ahead to see if they can arrange a Disney facing room! We completely forgot to ask about how the breakfast works but woke up the next morning to a pile of vouchers for the free breakfast (sausage or bacon with pancakes) or an upgrade to the buffet for $5 which we did everyday. The staff at breakfast were very friendly and polite and the service was excellent! Disneyland is about a 25 minute walk from the hotel and that depends on how long it takes you to cross the roads but we did that a few times. Bus takes about 15 minutes with tickets available from a little machine by the bus stop outside the hotel door (card only). Bus runs every half hour from 06:45 I think til 30 minutes after the park closes. We found the bus leaves the hotel at 30 past the hour and on the hour from Disneyland. The bus stop drops you off right by the gates and it is the closest you can get to the parks via transport which is great! Also at the hotel there is a laundry room with washing powder sold at the small shop by reception. The swimming pool and bus stop is shared by the hotel next door (staylbridge owned by the same hotel chain). There is a restaurant in the hotel called burger theory. We didn’t eat here but lots of people did seem to use the restaurant. In terms of local restaurants the garden walk is about 15 minutes walk away and has a few restaurants (bubba gump and Cheesecake Factory) but these were packed every night with long queues out the door! There are restaurants around the park but again packed in the evening. Target is a few blocks away and a small Walmart is a few blocks further. The angels stadium was just the other side of the freeway which was really cool to see and the Honda center was also not far away if your into sports! No real bad points to talk about as our stay was honestly perfect! Will be coming back again! Thank you! The hamburgers in the lobby were so good- hand crafted burgers to die for! The rooms had recently been remodeled and fit our families needs. We have two toddlers so the rooms were plenty spacious. The pool area was oversized and we could grill outside. Easy access off the freeway. We used the ART transportation to Disneyland. This hotel was a great place to stay for our family vacation to Disneyland. 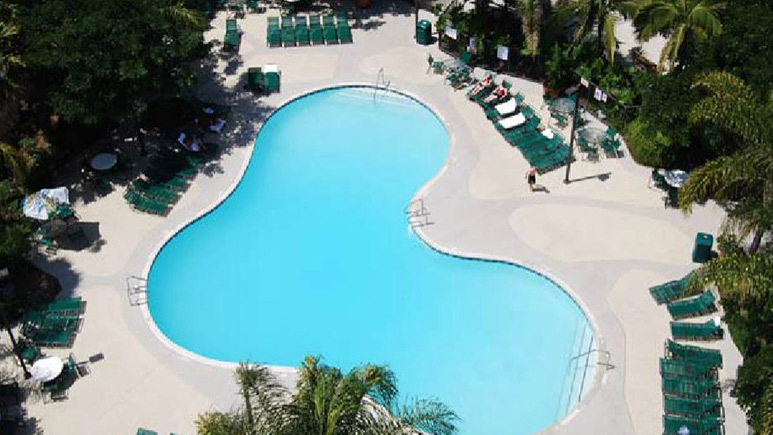 Great location, property well maintained, the staff was very nice and professional, the pool was huge/lots of seating. We took the ART shuttle to Disneyland (it picks you up to the right of the hotel lobby). Very convenient. The only drawback was our room faced the Santa Ana freeway so we could hear the traffic. On the plus side, we could see the fireworks from Disneyland every night from our window. This is my 2nd time staying here. Once when my kids were little and then again recently (in Jan 2018). Now my kids are grown. This place is perfect for a Disney trip. The room was a good size for the 3 of us. We all had room to change, took turns in the bathroom, etc. We really only used the room for sleeping but they were clean. The little refrigerator was nice. We brought our own bottled water to take to the park so it was nice that we were able to keep it cold. The beds were full size beds and we fit just fine. We always bring our own pillows so I can't comment on that. The shuttle is amazing! It showed up on time, every time. We got 3 adult, 3 day passes for about $14/each. We came and went as we pleased. And the shuttle stop was right at the entrance of Disneyland, you can't beat that! We came back to the hotel 2 of the days for dinner and to rest a little bit. It was nice to put our feet up for an hour or so. We went down and ate at the restaurant before we'd go back to the park to close it out. It was less expensive than the park and less crowded, plus free drink refills and they gave us drinks to go. With our package we got free breakfast each morning. It is limited to 2 items (not the buffet). But we aren't big breakfast eaters anyway so that didn't bother us at all. I think I saw for $5 more you can do the buffet. The staff here is super friendly. Parking was easy and we felt safe. We could also see the fireworks from our room which got us even more excited to start our "Disney til We Drop" girls trip!! We are already working on booking our next trip and will definitely stay here again. I have booked with Get Away Today 5 times now, each stay has been different but all great! I booked this hotel a few months in advance, and upon arrival I was a bit upset because I realized that I booked the wrong hotel. 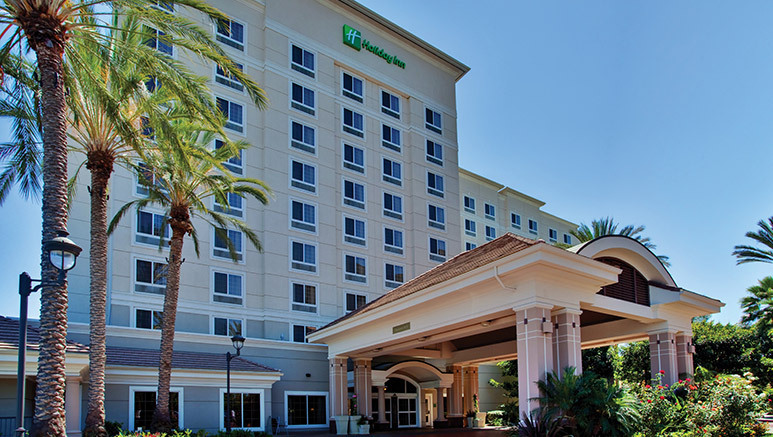 I was interested in staying at the Holiday Inn Express & Suites Anaheim Resort Area (1411 S Manchester Ave) because I thought walking distance to Disney may end up being cheaper than taking the ART bus, and also, free breakfast! Both of these hotels are located on Manchester St but this one is further away and definitely not walking distance, when we checked in others also had the same impression, and the front desk said it happens all the time! (So beware this isn’t the closer one) Once we checked in we were told parking was free which is also a huge plus! I asked about free breakfast and at first they told us we didn’t get any, which left me devastated, but once they realized we booked with GAT they provided us with daily vouchers that were a choice of 2 pancakes, sausage/bacon , and coffee or OJ, or 2 eggs, sausage/bacon, and coffee or OJ (or for 5$ breakfast buffet). The food was delicious! It also came with toast, and potatoes!!!! More than enough for breakfast!!! And I couldn’t stop talking about the coffee, so so good! Once we went up to our room, they gave us a double instead of a king, I didn’t want to make a big deal so we stuck with the double (no queens btw). The room was small so we unpacked and didn’t live out of our suitcases like usual. It had a cute clean bathroom, with a standing shower. I was a little disappointed about not having a tub because sometimes it’s nice to soak your feet after walking 8+ miles at Disney. But we got over it! The room had a little kitchenette with a Keurig, microwave and refrigerator. Overall I liked the room! And next time I’ll bring k-cups and creamer for early mornings! The last awesome part was the ART bus, it literally pulled up to the side of the hotel, inside the premises so you don’t have to walk and look for the bus stop and you can buy your ticket there as well. The bus only picked up from this hotel and dropped us off right in front of Disneyland’s entrance! No additional stops which was incredible! It can get packed early morning and towards the end of the night, so try to get there early (first bus is at 7:15 if the park opens at 8 and is every 15 and 45 after the hour). I would 100% recommend this hotel for those traveling in small groups 2-4 people and are getting one room. Sharing the double might be tough, but it’s doable! As for booking with Get Away Today, our trip was great. Everything worked out perfectly but always be sure to read the fine print! I thought booking 3 day park hoppers for Disneyland gave us the early morning each day for each park, but you only get one day Disneyland! I would recommend this site to anyone looking to plan a trip to Disneyland/CA Adventure! I love this hotel. We have stayed in the Anaheim area at five or six different hotels. But we always come back to this one. And now this one is the only one I book. The rooms are clean, the people are friendly, and they have a great breakfast for free. I have always found the food to be delicious. It’s close enough to Disneyland that it only takes two or three minutes longer than the other hotels. And you get so much higher quality for the price. We’ve stayed at quite a few hotels on various Disneyland trips. This is one I’ll avoid in the future. Upon check in the lobby appeared clean. Once in the room it was a while ole new story. First of all it was dusty. The bed sheets on the bed were worn through so you could see the mattress. But the worst part was the bathroom. Their were body hair we’ll say all over the counters and shower floor. The toilet was clogged and dirty. The breakfast was not good compared to other hotels with lower ratings. I thought it was a breakfast buffet but it’s jusy a simple eggs and pancakes or pay 5 dollars to upgrade to th buffet. I wasn’t aware of this until eating that morning which is always fun since I didn’t have the cash for a tip which the waiter was nice enough to point out. They were friendly. Every time we left the hotel they said to have a nice day and when we returned they said welcome back and to have a good night. They checked in regularly to see how we were doing which is new to me. Great hotel with awesome restaurant! This place was clean and comfortable! Very accommodating, they let us early Check in 4 hours before check-in time. The restaurant, Burger Theory, was awesome! Great food and great service! My family and I loved staying here! We stayed for 4 nights and it is now one of our new favorite hotels for when we go to Disneyland. 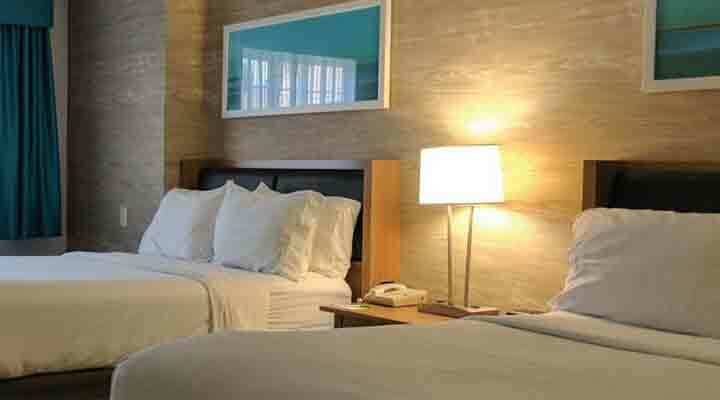 The rooms are very clean, comfortable beds and pillows. We loved having a great breakfast every morning in the in house restaurant. Our room had a great view of the fireworks going on at the park, and the walls are very well insulated because we didn't hear a peep from other rooms like we have at other hotels. Everything was just great, we loved it! I have gone to Disneyland every year for the past 5 years and 4 out of those 5 years I have stayed at the Holiday Inn Anaheim Resort. Staff is friendly, hotel is clean with comfy beds! Close freeway access and taking the ART to Disneyland saves on the parking headache and VERY convenient with a stop right there at the hotel! You won't regret staying here. We stayed here Oct 2nd thru the 14th. We had such a nice room, one king bed. It was on the 6th floor and I could watch Disney's fireworks out the window. Beds were so comfy and the room was kept clean. Hotel is clean and inviting. We enjoyed the free breakfast. Very good. We actually changed our hotel that we were going to be staying at in November over to this one. The rooms were very nice and so were the people! Great restaurant as well! We've stayed at this hotel before but this time was even better. From the newly renovated rooms to the delicious restaurant (burger theory) we couldn't be happier and would definitely recommend this hotel to anyone! Very comfy beds and pillows, very clean, loved the breakfast and coffee bar they offered for something quick. Loved our stay, everything went smooth and have no complaints. New rooms were so nice. We were one of the first families who got to stay in their new rooms, and they were so nice. We also ate at Burger Theory for dinner one night and it was awesome. Just pay attention to the restaurant hours, because they're not open all of the time. We also enjoyed the free breakfast. It's not a buffet, so you have to tip your server. You order from a small menu, but it was good and nice that it was free. I would stay here again.